Here you see a silicone mold used for the creation of hardcopy torsos for the Rancor Keeper figure. 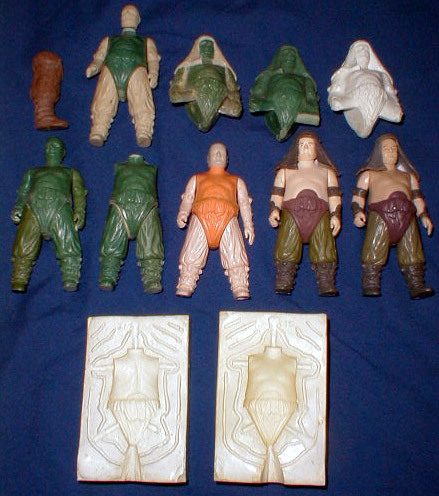 Molds such as these are created by pouring a silicone mold-making compound over the finished wax sculpt of an action figure component and then allowing it to set. They are made in two halves so that they can be easily clamped together and taken apart while being used to cast prototype figures. As you can see, the pegs at the limb and neck joints, which were included in the wax sculpt of the figure, have been retained in the mold. That cone-shaped gouge you see in the crotch area was where the liquid casting compound (likely Dynacast) would be poured when the two mold halves were clamped together. 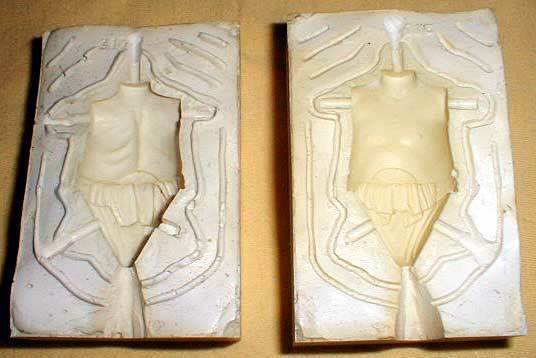 This second shot shows the exterior of one half of the mold. 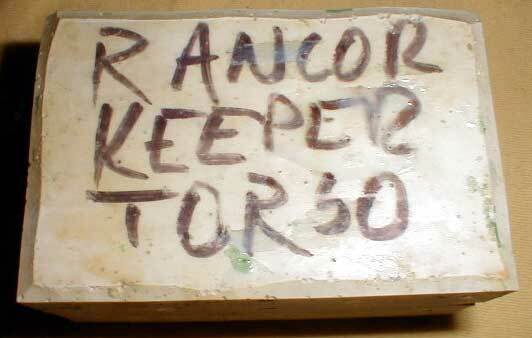 Someone wrote "Rancor Keeper Torso" on it for easily identification. Lastly we have a photo of a series of Rancor Keeper pieces, which includes examples of several stages in the process used to create the figure. Shown are several clay and wax sculpts, a silicone mold, a complete hardcopy, dynacast and silicone castings of the hardcopy for the figure's hood, an internal first shot, and an orange-and-tan first shot.